Pipeline Explosion In Ukraine Could Be 'Act Of Terrorism' : The Two-Way A section of the main conduit for Russian natural gas going to Europe exploded and caught fire on Tuesday, a day after Moscow and Kiev failed to reach a deal on gas payments. 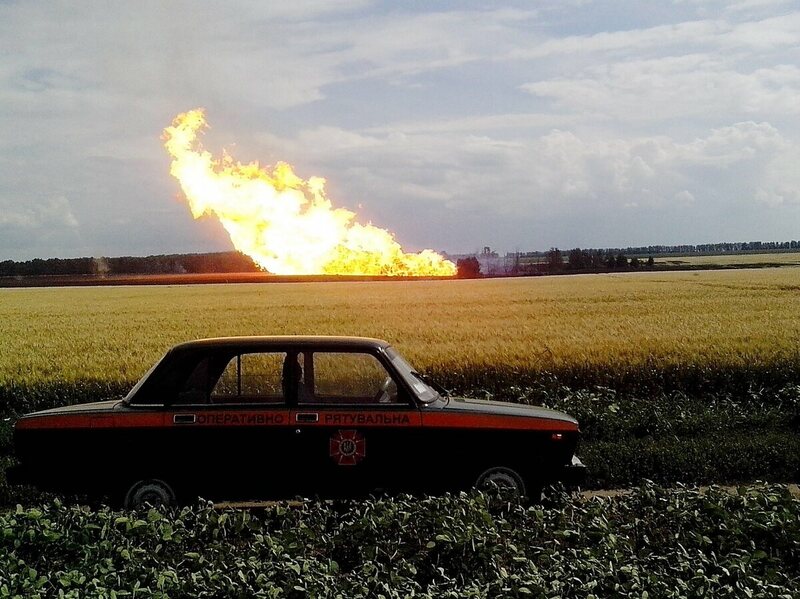 Fire from the explosion of a natural gas pipeline in Ukraine's Urengoi-Pomary-Uzhgorod in Poltava region, on Tuesday. Ukraine says an explosion along the main pipeline that carries Russian natural gas across its soil to Europe is being treated as an "act of terrorism." The explosion occurred just a day after Russia halted gas shipments to Ukraine in a dispute over payments. "The blast took place at the pipeline, which is also known as the Trans-Siberian Pipeline, in Poltava province on Tuesday. "Flames could be seen erupting from the Urengoy-Pomary-Uzhgorod Pipeline in central Ukraine. No one was reported injured by the explosion. "It is not clear what caused the blast. European and Russian companies said gas exports to the EU were not affected." The Associated Press says that the blast occurred far away from the fighting in the east where pro-Russian separatists are battling Ukrainian troops for control of key cities. Reuters quotes Ukraine's Interior Minister Arsen Avakov as saying that terrorism is just one of several theories about the explosion that are being investigated. "According to local residents, they heard two big bangs just before the explosion which could indicate they were deliberate explosions," Avakov said. In a statement, the country's Energy Ministry notes that "it is not the first attempted terrorist attack on the Ukrainian gas transport system."